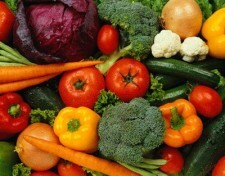 How can you tell when fresh fruits & veggies are ripe? Yesterday, I walked past the produce aisles at my local H.E.B. and read some signs. This age old wisdom we should have learned from our mothers and grandmothers made for an informative (and slightly amusing) set of signs. I could not believe that we are so divorced from our food that we need grocery store tutors to tell us how to select our produce, when to eat it, and how to store it. I learned the secrets of discerning ripeness from books and gardening magazines. These teachers strike me as tragic. Signs and magazines? Shouldn’t we just be able to intuit when fruit and vegetables are ripe? Isn’t that when they are supposed to be their most appealing, in order for us to pluck them and spread their seeds around and ensure the ongoing viability of their species? But, we can’t. And here’s why. We rarely, if ever, eat food anymore. We buy edible foodlike substances that have been manufactured for us by the food industry, and in order for us to eat these things their true taste, smell, and texture have been disguised behind chemical flavorings and deodorization processes. In short, we’ve trained ourselves in all the wrong ways to recognize non-food as food. This rings true for me, too. What I struggle with is how to regain that lost food knowledge. I’m sure it has something to do with growing my own food, but honestly I sometimes feel like a fish out of water. Can it be learned from experience and trial and error? Or is there some way to learn these insider secrets and save myself all that work? I live in a small, rural community with a pathetic excuse for a grocery store. It’s frightening to me how great the produce tends to look but how often it’s actually terrible, tasteless, and under ripe despite its appearance, especially the fruit, tomatoes, and avocados. Seems fruit, especially, is grown more for eye appeal than taste. At least that’s the type of fruit we tend to get. I’ve HAD to study up on how to tell when fruits are ready to eat based on more than just how they look. Learning how to shake a cantaloupe or honeydew, or what to listen for when thumping a watermelon has saved me a bundle! We eat very little fresh produce simply because the quality is so bad. Frozen or canned is generally much tastier simply because the growers didn’t pick it before it was ready and preserved it at it’s peak edibleness. How I’d love to go back in time and taste fruit and vegetables before man started messing with it. Hey skinnygirl! I think it can be figured out through trial and error. But if there is a book or other source with the information already, then that would save us the time of the trials and errors. I was very lucky and grew up with a fruit orchard and a vegetable garden almost year round. That’s the benefit of Texas; there’s almost an unending growing season (at least in the part I live in, that’s not so true in the panhandle). If you are mostly concerned about fruits and veggies and when to use them and how to use them, I’d recommend a farmers’ market. That’s where I’ve learned how to cook things like mushrooms (Dad didn’t grow those) and butternut squashes. So, maybe Kristen knows of a source with this information. I’m also concerned about us viewing non-food items as food. Things that immediately come to mind are chicken nuggets in the shapes of things, those gummy fruit snacks and kid’s breakfast cereals. These items in no way resemble the food item they purport to be providing. Thanks for commenting. I really feel for folks who are stranded with one small, disappointing grocery store as their only food resource. The encouraging thing might be that because you’re more rural, you might actually have small family farmers around you who could supply you with good food, but you just don’t know about them. Have you checked out the links on my resource page (under the heading Pages, in the upper right of the screen)? Eatwild and LocalHarvest are good websites to use to see what’s near you. Personally changing the food culture must begin with the consumers. We have the right to eat or to not eat. You just have to make the right decision and share the knowledge with others. Hats off to you, for doing so. We are at times when we need to be creating a federal definition of “Food”, yet Obama picked some one like Vilsack for the agriculture secretary. To me, I see this as a step back for America and the rest of the world in terms of sustainable farming and feeding our self with real food. We should improve the nutritional health of at-risk Americans. Right now, the only thing that we know how to do is to support the consumption of products that we know to be unhealthful. I was fortunate to grow up with a mother who did not buy many packaged foods. We lived in the suburbs but my parents rented a small gardening spot to show us the joy of growing and eating our own vegetables. Things like; strawberries in the spring, tomatoes over the summer, Japanese sweet potato in the fall, and potatoes during the winder months. Yes, it was child’s play and nothing serious, but from early on, my parents wanted to teach me why it was important to eat locally and eating according to the season. Now I live in Southern California and do not have a big plot of land, however, have been growing tomato out of a container every summer for the past five years. It’s been a tough trial and error but have become better at it every year and this summer yielded easily over 300 mini tomato from our garden. These days, I wont eat tomato that is not in season. In stead just reach for the canned stuff during the winter months. One tip that I can share with you is for all of us to find a CSA farm (community supported agriculture) and find joy in eating locally and seasonally. I have been doing so for 2 years now and its been quite the adventure! As Kristin points out on the comment above, Localharvest.org has a great section dedicated to CSA. H.E.B. ? Are you in Texas ? I’m just blown away by the kind of resources you’re putting together here– found yr blog while trying to find info on whether a batch of yogurt/spelt dough that got too hot would still be good. It’s kinda flat n quiescent and while it doesn’t smell bad, it doesn’t have the same attractive ultra-bready smell it had when I first mixed it. Anyway. I wanted to point you at the National Junior Horticulture Association, NJHA. When I was a sprout in rural NH, I was involved with 4-H (another great resource!) and also joined NJHA. They had contests at local fairs for fruit and vegetable judging, and taught me how to recognize good-quality fruits n veggies. I’m boggled at the irony that the skills I learned growing up poor in rural New England, with goats, chickens, gardens, livestock, are now, almost 30 years later, the kinds of things people want to learn. Living in my teen years in a 100+ year old farmhouse in Maine that was heated only by 2 wood stoves, had a single cold water line from the spring on the hill, and no flush toilet. We raised a couple of pigs and a steer annually, and didn’t buy much meat other than chicken– the one year we raised meat chickens, well, they were zomg delicious but the whole plucking and diy slaughtering thing was a bit much for us. Maybe not doing the whole batch at once would have helped! Anyway I am rambling, but hi, great to ‘meet’ you, and ROCK ON with the Food Renegade-ing! !